(Front, left to right) Mark Kimball, Erlanger Western Carolina Hospital (EWCH) CEO; Pam Roman, Clay County Chamber of Commerce Executive Director. (Back, left to right) Russ Paine, EWCH Human Resources Manager/Safety Officer; Wesley Phillips, EWCH Plant Operations Supervisor; Richelle Phillips, EWCH Performance Excellence Coordinator. 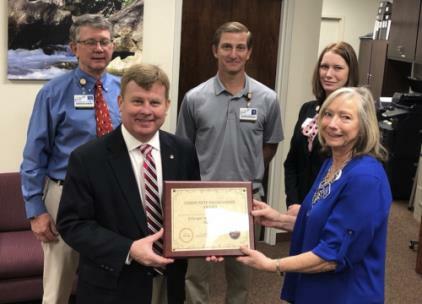 The Clay County Chamber of Commerce presented Erlanger Western Carolina Hospital with the “Community Engagement Award” on Saturday, Jan. 19, in recognition for its investment in the western North Carolina community. “We are honored to receive this award from the Clay County Chamber of Commerce,” said Erlanger Western Carolina Hospital CEO Mark Kimball. Clay County Chamber of Commerce officials expressed their appreciation for the hospital.